Fishing was a major industry in the Northeast, from colonial times until the early 20th century. 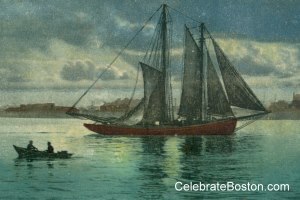 Maritime folklore was prevalent in the culture, with many stories of ghost ships and giant sea monsters being published in the newspapers over the years. Stories of sea serpents would be published in clusters, as if a monster strayed into a section of water and then vanished into nowhere. The following is a very interesting account of the sea serpent, seen on Saturday last. The respectability of the source of the [attached] certificates, place the matter beyond a doubt—and we think Capt. Woodward has had a more minute view of this Serpent, than it was possible for any one to have had of the one seen last summer off Cape Ann. I, Joseph Woodward, Master of the Sch. Armament of Hingham, on my passage from Penobscot to Hingham, on Saturday last, at 2 o'clock, P.M. Agementicus bearing W.N.W. ten leagues distance, discovered some thing on the surface of the water apparently about the size of a ship's long boat. Supposing it to be the wreck of some vessel, I made towards it; and on approaching it, to my surprise and that of my crew, discovered it to be a monstrous Sea Serpent—as we approached him, he threw him self into a coil & darted himself forward with amazing velocity—the wind being ahead, it became necessary to stand on the other tack, and as we approached him again, he threw himself into a coil as before, and came across our bows at not more than 60 feet distance. Having a gun charged with a ball and shot, I discharged the contents of it at his head. The ball and shot were distinctly heard to strike him and rebound as though fired against a rock—he, however, shook his head and tail most terribly—he again threw himself into a coil and came towards us with his mouth wide open. In the mean time, I had charged my gun again and intended to have discharged the contents of it into his mouth; but he came so near us, I was fearful of the consequences, and withheld it—he came close under the bows of the [schooner] and had she not been kept away must have came on board of us—he sunk down under the vessel, his head a considerable distance on one side the vessel and has tail the other—he played around us about five hours—I and my crew had probably the best opportunity of seeing him that has occurred—I judge him to be, at the least twice the length of my [schooner] say one hundred and thirty feet—his head was about the size of a ship’s long boat, sav fourteen feet—his body, below the neck, at least six feet in diameter—his head was large in proportion to his body—his tail was formed like a squid's—his body was of a dark color and resembled the joints of a shark’s back bone—his gills were about twelve feet from the end of his head, and his whole appearance was most terrific. His manner of throwing himself into a coil appeared to be done by contacting his body in a number of places in perpendicular directions, and placing his tail so as to throw himself forward with great force—he could contact and throw himself in any direction with apparently the greatest ease and most astonishing celerity. Having read the above statement of Capt. Woodward, we certify to the correctness of it. Personally appeared, Joseph Woodward, Peter Holmes, & John Mayo and made oath, that the above statement is just and true—before me.